"Even the mightiest oaks will fall eventually." Autumn Years by Adam Baron speaks to how even as we learn and grow, despite success, riches, and love, every human faces the same fate. 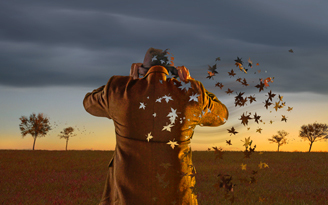 Using photography and digital manipulation Baron captures the reflective beauty in deterioration in this evening landscape featuring a male figure being broken apart into fall leaves. "Our first defense against summer heat." 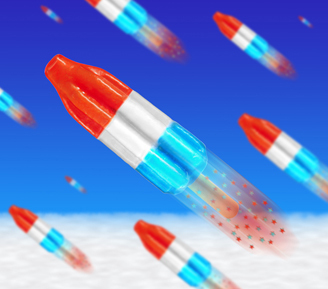 Bomb Pop by Adam Baron is a patriotic explosion of color created using photography and digital artistry. It features multiple red, white, and blue popsicles flying through the sky like rockets, perfectly spaced, falling stars in their wake, racing to relieve people from the summer heat. 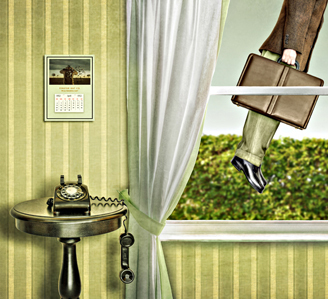 Called Up by Adam Baron is a Mary Poppins like photograph of an old fashioned phone off the hook, with a man floating skyward outside the window with his briefcase. This surreal photograph is composed in various shades of green which gives it a lighthearted and warm appeal, with creative framing and a self-tribute in the wall hanging calendar. This playful wall art is a perfect sendoff in an entryway, welcoming the week enthusiastically. 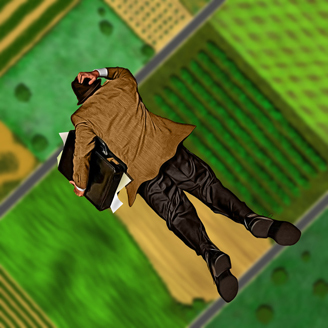 In Cast Down by Adam Baron a door to door salesman is falling out of the sky towards vivid rural farmland below. What would be a very serious piece becomes lighthearted through the artists comment, "That sales pitch didn't go over too well." Colorful and creative, this fine art print captures a piece of summer farmland to be cherished year round. 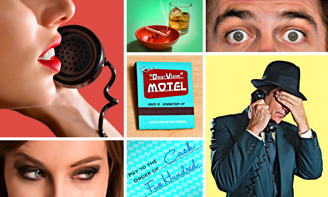 Collect Call by Adam Baron is a group of photographs assembled like a graphic novel. Bold facial expressions and colorful backgrounds create a dynamic narrative within a piece of wall art for the home or office. 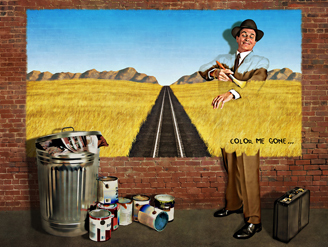 Color Me Gone by Adam Baron is a whimsical photograph that shows a landscape wall mural on brick, standing in front of it is a businessman happily painting himself to blend in with the mural. This contemporary fine art print is both lighthearted and somber, relating to the fact that every person faces a day in which they wish they could disappear. 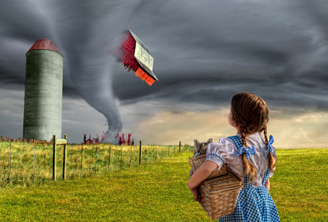 Dorothy and the Tornado by Adam Baron is a piece referencing the classic story of Wizard of Oz, in the few moments before Dorothy is swept up and deposited in the fantasy world. The vibrant blue checked dress and bows combined with the green grass creates an atmosphere of summer fun, contrasting with the deep violent gray of the tornado and the bright red of the barn being swept away. 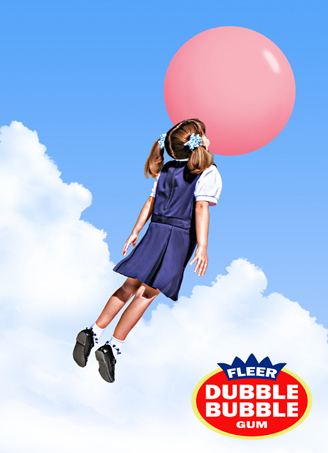 Dubble Bubble by Adam Baron is a playful surreal photograph designed like an old time advertisement featuring a girl in a blue dress floating away using her giant gum bubble, surrounded by various shades of blue and white sky and clouds. This fine art piece features the aesthetic of past idealism found in mid-century commercialism. 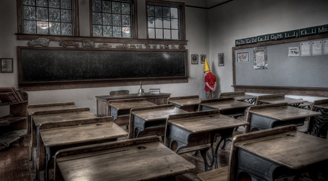 Dunce by Adam Baron is a nearly monochrome image with a tiny spark of color, the young boy in a red shirt, standing in the corner for punishment, a bright yellow dunce hat on his head. This sorrowful fine art photograph is a reminder of childhood misgivings captured with complex framing and an antique feel. 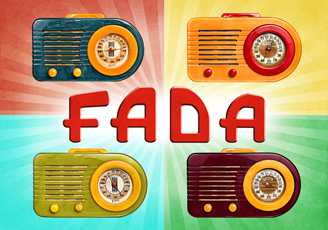 FADA by Adam Baron is a colorful print featuring a homage to "the most beautiful radio company of our past." This vibrant, four pane print appears in a rainbow of bright colors with bold typography and minutely detailed dials. 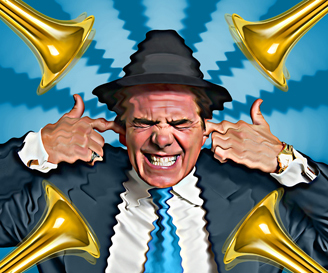 Fanfare by Adam Baron is a colorful photograph digitally manipulated to reflect the blaring noise of horns. The man featured is grimacing at the sound, desperately plugging his ears in an attempt to shut it out. This piece is captured in electric blue and bright gold. 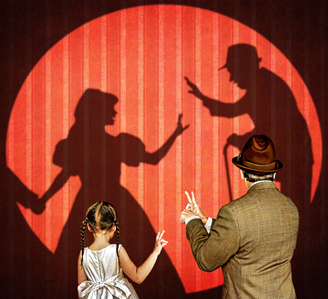 Fun with Hand Shadows by Adam Baron is a sweet yet sad piece of conceptual photography showing a father and his little girl playing with hand shadows on the wall, but the shadows portray the story of the girl all grown up, married, and waving goodbye to her elderly dad. This fine art photography is described by the artist as, "Shadows of an inevitable future." This wall art would bring sweet memories to mind when featured on a living room wall. He Has Left Us Alone by Adam Baron is a melancholy work of photography showing a man alone in a room of blue, playing a horn. A narrow shaft of light brushes his shoulders. 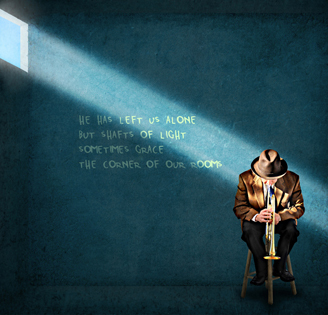 Behind him is written, "He has left us alone but shafts of light sometimes grace the corner of our rooms." This simple wall art conveys a complex meaning of loneliness and hope. 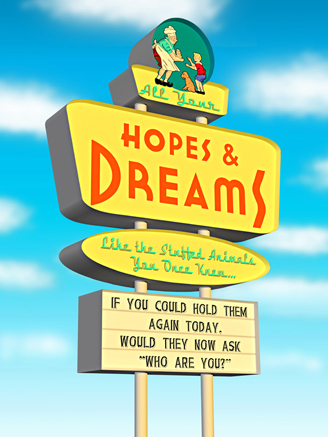 Hopes and Dreams by Adam Baron is described by the artist, "When not even your own nostalgia recognizes you." This colorful digital art piece is a daily reminder to pursue your dreams, but also to accept that dreams can change. 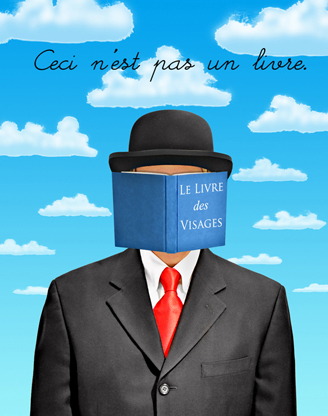 Le Livre des Visages by Adam Baron is French for "The book of faces". Above the strange portrait of a man with a blue book covering his face is written in French, "This is not a book." This digital art piece is a comical yet conceptual take on the popular social media site, Facebook. This piece conveys a deep meaning through disguising the character, showing how social media is never a true portrayal of a person's life or identity, but a facade. 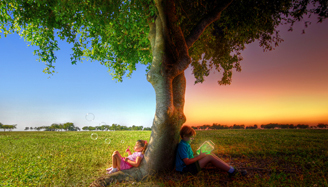 Like Night and Day by Adam Baron celebrates the adventures of childhood exploration with a commentary on the differences between girls and boys. This work of landscape photography is a vibrant piece for the living room or bedroom that is a reminder of juvenile innocence. McFuture by Adam Baron is a reminder that mother nature will eventually reclaim what is hers. 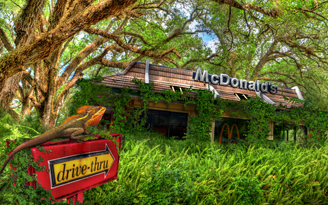 This digital wall art shows a possible future featuring a McDonald's overcome by lush vines and ferns, the drive-thru sign now the perch of a colorful lizard, not a person to be seen. This colorful digital piece is a stunning example of the fine art photography and digital artistry that goes into the creation of this artist's work. 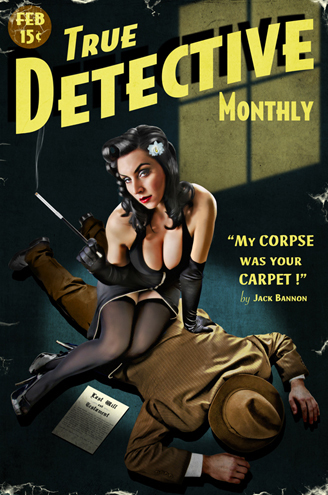 My Corpse Was Your Carpet by Adam Baron is a sensual take on an old fashioned book cover, featuring a sultry woman smoking while sitting on the corpse of a man, making a play off of the Jack Bannon book covers. This wall art is eye catching and has a vintage appeal. 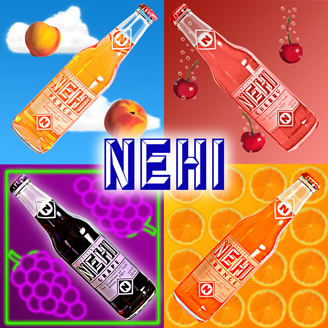 Nehi by Adam Baron is a colorful and playful take on a vintage advertisement for Nehi sodas, composed in bold orange, purple, red, blue and green. This bright wall art is perfect for the kitchen to add a splash of color and vintage flavor. 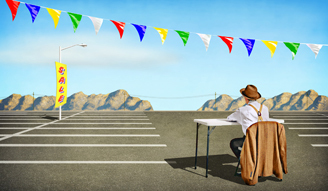 Open for Business is a comical and lonely digital piece featuring a man at a table selling… nothing. The joke is that the product is going fast, but there is nothing to be seen to be for sale. This thoughtful piece evokes a sense of mystery and the question of sanity. Adam Baron’s fusion of fine art photography with digital artistry inspires the vivid exploration of his pop-art fondness for all things past. Using a variety of digital manipulation techniques, filters, lenses, and time exposures, he creates a captivating blend of past idealism with a unique modernist’s spin. Baron’s interest in photography started at an early age where his fascination with the world was portrayed in commercialized perfection from the mid-century. It was a world of dapper, fedora-wearing gentlemen, white-picket fences, suburban families, and cars with curves. Adam Baron’s artworks are featured on many book covers, magazines and the New York Times. Baron’s artwork is represented exclusively by Mahlstedt Gallery.